A chronicle of the carnage resulting from the release of guns to criminals as part of a government sting. tags: During a border's darkest hour, guns walked the streets. Set in 2009, Gunwalkers chronicles a string of violence following the U.S. Government's release of guns to known criminals. After his daughter is murdered in cold blood by a lawless gang, Hank, an everyman, is forced to take matters into his own hands to clean up the streets. But when a crazed gunman opens fire at Hank's place of work leaving him seriously injured, the fight for justice is gravely imperiled. In a last-ditch effort, Hank enlists a hardened, battle-tested militia to hunt the killers across the unforgiving Sonoran Desert. A chronicle of the carnage resulting from the release of guns to criminals as part of a government sting. This intense and powerful film blends the tightly ratcheted tension of a film noir with the smarts of a psychological thriller. The director fully immerses us in a dystopian world where the line between good and bad is severely blurred. This is an authentic and taut body of work that will undoubtedly stand the test of time. If you're into crime, drama, and action, this certainly is the film for you. Watching this film I was reminded of the unforgettable vintage noir paperbacks I read growing up. Kudos to Mr. Sandoval for the tour de force he has brought to the screen. Coming into this movie I had high expectations. 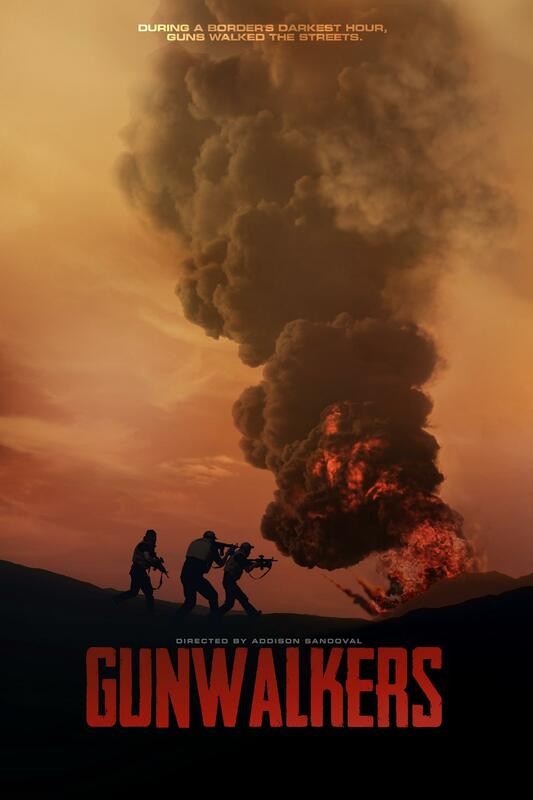 With a title like Gunwalkers I was expecting to see a lot of action and I can say the director achieved all that and more. The performances are strong and convincing and the script is smart and refined. This film has a ton of action scenes and some really elaborately planned and executed shootouts, but what I think I like most about it is that the film also has some really serious drama. When you think you know what's going to happen, suddenly things change and as an audience, we're compelled to rethink the meaning we're attaching to the visuals. This great because you get to see things in a different light. I would characterize this as an original film in every respect and I really want to praise the filmmakers for not being afraid to go against the grain and try new things with this genre. There is something for everyone, it has really diverse cast, and I feel you really get a sense of the world these people are living in. I recommend this movie highly to anyone who is into drama with a mix of realism.